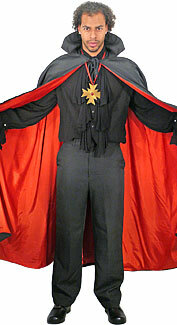 A black and red reversible velvet hooded cape. 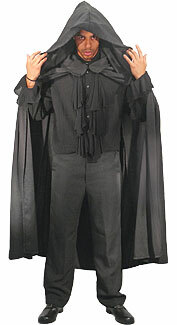 A black velvet hooded cape an intricate design. 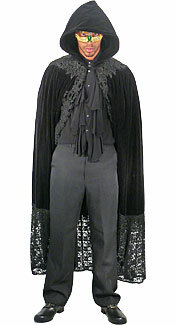 A black velvet hooded cape with lace trim. 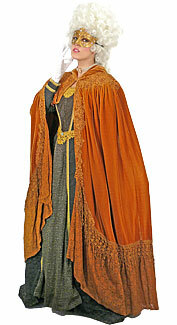 A golden-brown velvet hooded cape with lace trim. 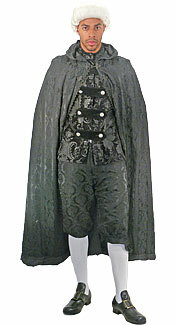 A black brocade-patterned hooded cape. 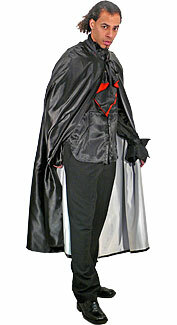 A black cape with an over-sized hood. 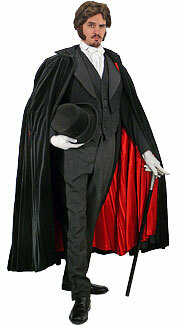 A black velvet cape with an over-sized hood. 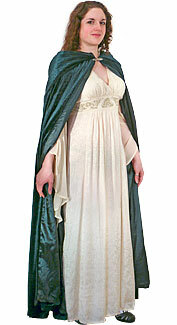 A green velvet cape with an over-sized hood. 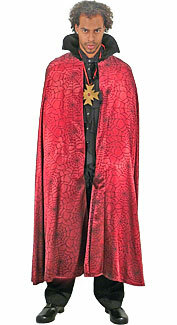 A black brocade-patterned cape with red lining. 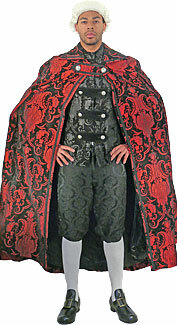 A red and black brocade-patterned cape. 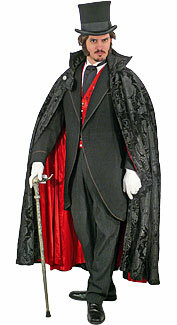 A black velvet cape with red lining. 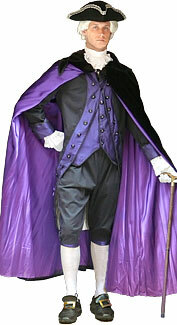 A black velvet cape with purple lining. 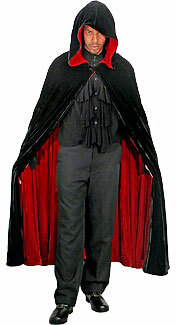 A black collared cape with red lining. 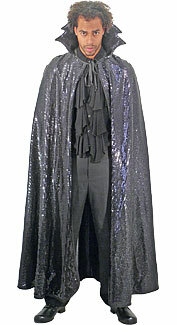 A black collared cape covered in sequins. A maroon cape with a spiderweb pattern. 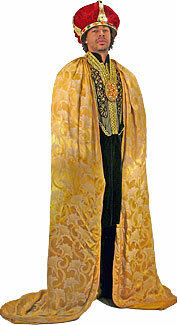 A deluxe-quality gold royal cape. 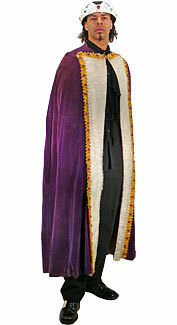 A royal purple velvet cape with fur trim. 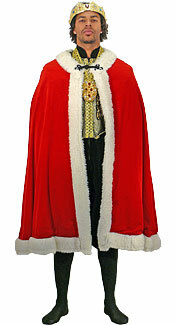 A red royal cape with fur trim. 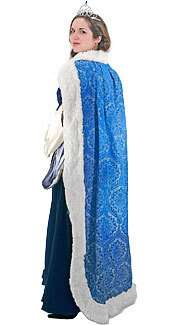 A royal blue cape with fur trim. 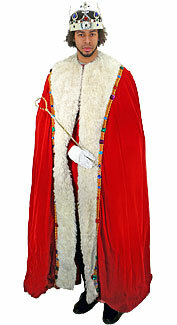 A royal red cape with fur trim. 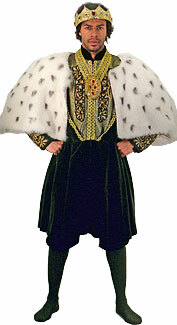 A short white fur royal cape. 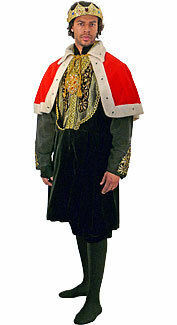 A short red royal cape with fur trim. A metallic gold pleated wingspan cape. 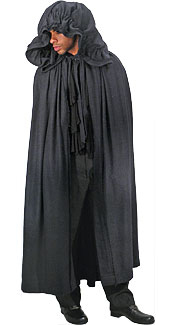 A metallic silver pleated wingspan cape. 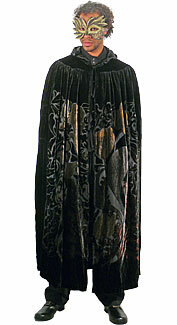 A metallic black pleated wingspan cape. 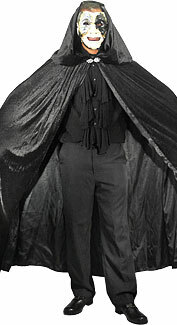 A shiny black cape with white lining. 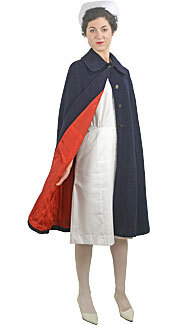 A navy blue collared cape. 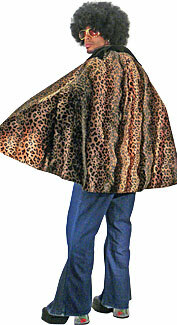 A 1970's-style cape with a faux-fur leopard print.